Andreas Oser was and is currently heavily involved in many litigation cases, among others related to medical devices and important drug products. 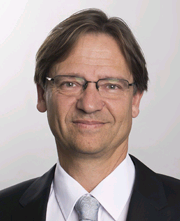 Andreas Oser has been working in the IP field since 1991, became German and European patent attorney in 1995 and is managing partner at Prüfer & Partner since 2002. In addition he holds an LL.M. degree in International Intellectual Property Laws (University of Hagen). Prior to working in IP field, he studied chemistry at the University of Freiburg i. Brsg., and then made his Ph.D. and postdoc studies at the Max Planck Institute for Biochemistry in Munich. A. Oser in GRUR Int 2006, 539 (=IIC 37, 520-550 (2006)): “European Patent Litigation Agreement - Admissibility and Future of a Patent Dispute Regulation in Europe"
With some 100 members, including 22 German and European patent attorneys and lawyers, Prüfer & Partner mbB is one of the renowned IP law firms in Europe and Germany. The firm’s field of expertise and activity mainly covers protection as well as enforcement and defence of inventions in all technical fields. As a one-step service, it also advises and supports its clients in other legal matters, with a focus on all IP-related rights and aspects.